Your overall anatomy needs more work however. I am not pro when it comes to anatomy myself but I made some annotations for things I would change in front view. currently the arm flows directly into the shoulder, which makes it look disconnected to the body. Try to get the arms closer to the chest while keeping the shoulders where they are. 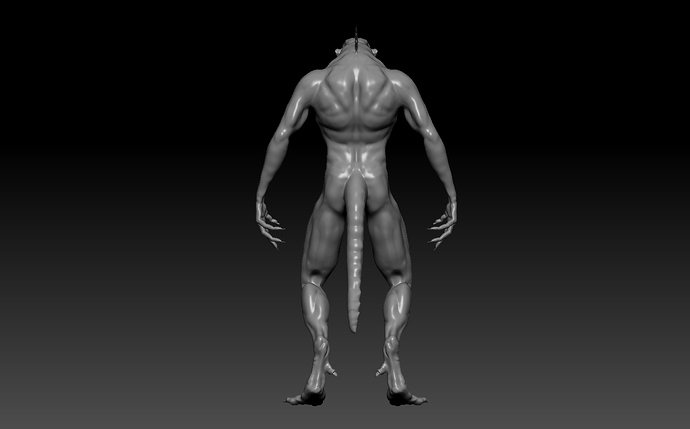 As a general advice, I recommend you to do gesture sculpts, where you focus on a proper silhouette and volumes. A strong base makes it much easier to put down the muscles later on. Hi Zaxel, thank you so much for the feedback, i really appreciates your kindness to take the time to pointed the biggest mistakes in my character and olso I’m feel very happy to know that have some skills to became a good artist with alot of hardwork and dedication.